If you are new to keeping a pet turtle, you might be wondering what supplies your new pet will need. Generally, turtles prefer to keep things simple, but whether your pet turtle is aquatic, semi-aquatic, or a land turtle such as a box turtle, you will need certain supplies to keep him healthy, and to make your turtle feel safe and comfortable in his habitat. Your turtle will need a glass or acrylic tank that is at least 20 gallons. When it comes to turtle tanks, bigger is better. Some owners start out with a 55 or 75 gallon tank, while others start smaller and upgrade as their turtle grows. You will also need an aquarium hood cover for your tank to keep your turtle inside, and to keep children and other pets from harming him. Your tank will need to be equipped with a filtration system to keep the water clean. Most semi-aquatic turtles will do fine with no more than 50 percent of the tank dedicated to water; however, aquatic turtles need the majority of the tank to be water, with no more than 25 percent of the tank dedicated to a land feature. You will need a safe water conditioner to de-chlorinate the tank. Include a ramp, or "dock," so your turtle can climb in and out of the water. This can be a clean, worn piece of driftwood, a piece of log, or flat rocks. Box turtles will need a shallow water dish that is big enough for them to climb into. All turtles need a certain amount of UVB rays to stimulate vitamin D production in their bodies, otherwise they will get sick. You will need to provide your turtle with a heat lamp, and make sure he gets exposure to real sunlight each day. During the winter months, your turtle will need nighttime heat as well, so provide him with a ceramic heat emitter, a heating device that gives off only heat, and not light. You will also need a tank thermometer to make sure your turtle's habitat is the right temperature. Your tank should have an area where your turtle can bask. You can use a substrate such as soil, sand, or aquarium gravel, or arrange rocks to provide a flat and stable surface for soaking up the warmth and light from the lamp. Avoid using wood chips or tree bark with an aquatic or semi-aquatic turtle, as he may ingest these and suffer an intestinal blockage. The rule of thumb when creating a habitat is to keep it simple; a cluttered habitat can promote bacterial growth and disease. It's no fun being out in the open all day and night. Your pet turtle will appreciate the chance to retreat into a shelter for a little privacy. You can make him a shelter or cave out of rocks, wood, or arrange some live or artificial aquatic plants. If you choose to use live plants, make sure you do your research and consult your veterinarian to be sure the plants you select will not harm your turtle buddy. In the wild, turtles are opportunistic feeders who will eat when and what they can. It is important not to overfeed your pet turtle. Herbivore species will need a variety of vegetables and plants, while carnivorous turtles will need live food or frozen food that you have thawed to serve it. Omnivorous turtles will need a variety of both meat and vegetables. In addition to prepared foods, you can feed your turtle a variety of fresh foods, depending on his diet. You will have to provide him with a calcium supplement as well, to keep him healthy. 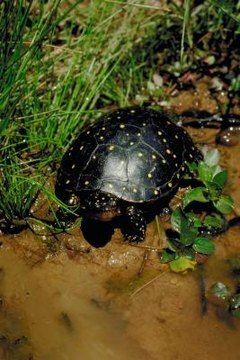 Box turtles will need access to fresh water. It's essential to keep your turtle's habitat clean so that he can be healthy. You will need a small net to remove debris, waste, or uneaten food. Put your turtle in a safe container designated for the purpose during tank cleanings. You will need special cleaning products to clean and sterilize the habitat-cleaning tools, because soap and water can harm your turtle. You will need a pH test kit to ensure safe water chemistry. A clean tank will make for a contented turtle and years of fun with your reptilian friend.